Not exactly the Final Frontier. o take Star Trek, a science fiction television and movie franchise based around drama and morality, and to adapt it into a massively multiplayer game can't have been an easy task for Cryptic Studios. Considering further that the project has only been in development in earnest since June 2008, it's even more impressive. But despite the undeniably huge amount of thought and effort that's gone into it, Star Trek Online doesn't quite deliver on the epic scale of the franchise's "Final Frontier." Unlike most MMORPGs, STO is comprised of two forms of gameplay: space-based starship operations and the on-foot away team missions. Having wisely taken inspiration from the more faithful flight simulator-style Star Trek games like the Starfleet Command series, the former is definitely the more robust. On a basic level, battle revolves around taking down your enemy's shields with your phasers and photon torpedoes before they do the same to you. However, positioning plays a large part in this with effective combat requiring good awareness of weapon firing arcs, exploiting weaknesses in enemy shield areas and tactical micromanagement of energy allocation and abilities. Overall, this is probably the deepest, most satisfying aspect of STO. All that serenity is going to waste: ship-to-ship combat is probably the most satisfying aspect of the game.The ground-based gameplay is not as enjoyable but gets the job done. Just imagine World of Warcraft with phasers and gadgets instead of ranged weapons and magic and you'll know pretty much what to expect. This includes the clunky controls and animation most on-foot MMORPGs suffer from, which is particularly evident during player versus player matches. It also lacks the same amount of tactical depth found in the space combat, with skirmishes never really becoming more than simple battles of attrition. Positioning your team can be important due to various area of effect attacks and the ability to inflict extra damage to foes when flanking, but I rarely felt the need to do this as hammering on my ability keys seemed sufficient enough to get me through. Your captain and crew are persistent between both space and ground sections, having certain talents and abilities in each which are dependent on their race, specialisation and how you spend their training points. The latter is especially important, as these learned skills form your typical buffs and debuffs, as well as executable abilities such as a tractor beam that restricts enemy movement or a deployable phaser turret that provides extra firepower. Positioning your away team can be important in skirmishes, though simply hammering on ability keys was sufficient for me.Cryptic has become known for deep customisation options, and STO is no exception. Your captain, crew and their individual uniforms can be personalised in-depth with the largest amount of options and sliders I've seen in character creation since Cryptic's last game, Champions Online. You can choose your characters' race from a variety of those found in the Star Trek mythos or create your own if you'd prefer to make an original species. The customisation options for your Federation starship aren't quite as powerful, with a limited pool of parts available depending on your chosen class. You can, however, pick from a range of finishes and coloured decals for your hull and can of course give your vessel a personalized name and registry number. The game's presentation is also a strong point, proving to be particularly authentic to the franchise. The graphics engine is very scalable and features some fantastic looking space scenes and landscapes on the higher settings. The sound especially is spot-on, featuring all the instantly recognisable Star Trek effects like the shimmering sounds of transporter beams to the beeps and whirrs of tricorders. Cryptic even went to the trouble of hiring Spock actors old and new — Leonard Nimoy and Zachary Quinto respectively — to provide some limited voice work for the game. Captain and crew can be personalized with wide options Cryptic's become known for.STO has two playable factions, the Federation and the Klingon Empire. The former side has an entire galaxy of quests to embark on and has clearly been at the developer's centre of attention, leaving the latter feeling somewhat incomplete at launch. Though its focus is clearly player versus player combat, the Empire (which is comprised of the Gorn, Orion, Nausicaan and Klingon species) is simply lacking content, with next to no PvE quests available and extremely limited ship customization options. Bearing in mind all current PvP actions accessible through the user interface, there really isn't much exploring or battling to be had outside of instanced arena fights. Furthermore, the ability to create a warrior of the Empire is locked away until you've reached a certain level with a Federation character, which is both annoying and further highlights the Klingons' current status as a mere bonus faction. But probably Star Trek Online's biggest problem is its representation of the "Final Frontier" itself. As with Cryptic's other recent MMO Champions Online, the universe is entirely instanced. While this method has certain advantages when used sparingly, STO's complete adoption of it has resulted in a bizarrely fractured galaxy. Much like parallel dimensions, you could be in the same area of the game as a friend at the exact same time and might not see each other because you've been deposited in different instances. This even extends sector space, the game's hub zone and strange answer to travelling at warp, meaning there is not a single persistent area open to every player. Further damaging any dynamism the game may have had is the inability to both visit star systems without the relevant active quests and to interact with opposite faction players outside of PvP instance matches. These factors serve to cripple any sense of inhabiting a living, breathing universe and severely limit player-versus-player actions, feeling like a series of small, interconnected boxes instead of the sprawling galaxy you'd expect from an MMO based on Star Trek. Instancing turns what should be a sprawling galaxy into a series of small, lonely boxes.STO's issues might have been easier to forgive were they not charging so much for it. Cryptic have decided to charge the same premium monthly fee of $14.99/£8.99 as top-tier MMORPGs like World of Warcraft. Technically, it's even more expensive if you take into consideration the additional content that is locked away unless you convert more real life currency. The game purposely limits you to a paltry two character slots in hopes you will purchase more from Cryptic's digital store, where you also have to go to pay for character name changes and reallocation of skill points. While such a micro transaction system isn't unheard of in online games with low or nonexistent subscriptions fees like Battlefield Heroes, to be expected to pay extra for such basic options on top of a premium monthly fee and the price of the game at retail is excessive for any MMO, let alone this one. 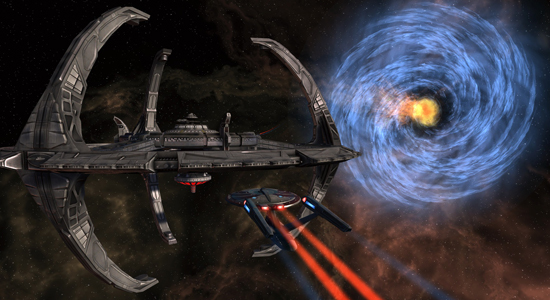 In this Star Trek fan's opinion, Star Trek Online is ultimately a disappointment. I wasn't expecting the compelling human drama found in the TV episodes and feature films here, but I was at least assuming to find a galaxy worth exploring. On the whole, STO isn't a bad game but with the likes of EVE Online and Mass Effect 2 providing more immersive final frontiers, I can't see myself going boldly back to it in the months after launch. My first thought when reading was EVE Online — the game really is a universe in a box. I don't see how well Cryptic can defend shortcomings in producing a similarly expansive environment. The main reason I keep hearing for the way the game turned out was that Cryptic were only working with a small budget and time-frame. To that argument, I point to EVE Online which was created by tiny Icelandic company and has portrayed a realistic open universe since 2003. With about 12 hours into this game I honestly have to say I am very disappointed as well. All the reviews out talking of no game play glitches apparently didn't get too involved with the Mission system (dropped missions, statuses reverting back to a prior status and having to re-do the entire mission... etc) as I burned hours on Missions "forgetting" that it was accomplished when I got the prompt to warp out. Also the game play lacks a lot in free will and free exploration. You are stuck to navigating a very shotty low detail "subspace" map 70% of your time to only get shoved into another bounded space fight or a "go here and teleport to the surface" type missions. In addition, the flight controls are not even remotely what you would expect from a "space" game. Flight controls are limited to what would be a limited version of earth's atmosphere physics restrictions (Which space flight limited even further to essentially what you would expected from a 747? Lame...). Ascent / Descent angles are limited to about 45% inclines / declines, you can't fight upside down or even fly straight up or down. These things make space combat a chore. In addition the rate which you can turn early on (I'm a Lieutenant lvl 6) is like turning the NASA crawler... Slow and uneventful. This adds insult to injury for what could / should have been rather up beat space combat with quick action. If you are looking for a WoW or Aion style AH you will also be disappointed as their variant lacks many of the features we all have grown to expect. All in all... The game might be fun to play with some friends... Go raid a few borg cubes / spheres... But I do not see a huge future for this game without some large improvements. If you are a Star Trek fan, you might get some enjoyment out of Nimoy doing vocals... You might get a kick for the first few hours of strolling through some galaxies and blowing things up, but the game doesn't have the staying power it should when it comes to holding interest nor the versatility that you would expect of an MMO hoping to capture even a part of "living in the Star Trek Universe" ideal. I'll likely suffer through this months subscription, after that I'll be writing off my $75 spent and thinking of it as the cost to get the communicator badge pin that can collect dust on a shelf.